Hearty and healthy all in one meal? I’m in! I often associate hearty with rich, comfort food that’s probably best eaten in moderation, but this pasta leaves you with no guilt. 1. In a large skillet, heat 1 tablespoon of olive oil over medium heat. Add ground turkey to pan and cook until nearly browned. 2. 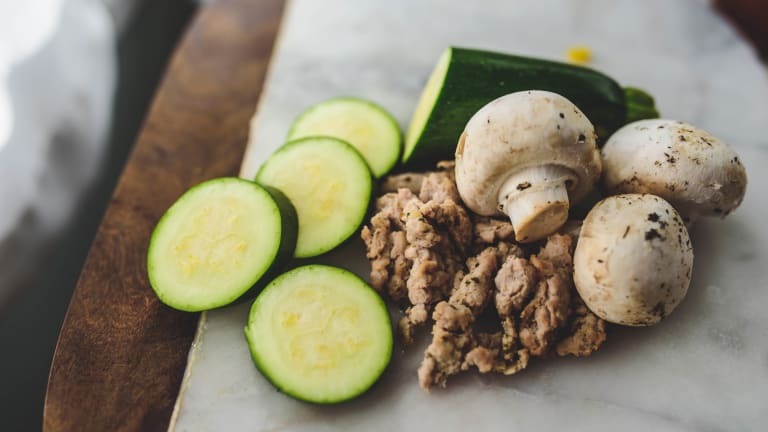 Add zucchini, mushrooms, carrot, onion, and garlic and cook about 8 minutes, or until vegetables are lightly browned and beginning to soften and turkey is cooked through. 3. Add the crushed tomatoes, as well as the oregano, basil and salt, and pepper. Simmer for 20 minutes, or until vegetables are tender. 4. Cook pasta according to package instructions and serve the sauce over the pasta.